Francisco Bay Area correspondent Rommel Conclara. 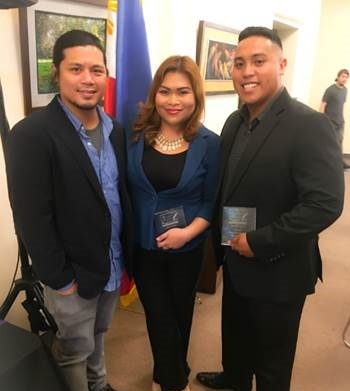 “Balitang America” scored victories at the 5th Plaridel Awards held by the Philippine American Press Club (PAPC-USA) recently at the Kalayaan Hall of the Philippine Center in San Francisco. The Plaridel Awards recognizes excellence in Filipino American journalism and is open to all journalists whose works have been carried by Filipino American news media. ABS-CBN North America News Desk Editor Henni Espinosa won Best Television Community Reporting for “OFW Concerns”. In her team are videographers Jeremiah Ysip and Nino Nucum with Danny Manansala as editor. San Francisco Bay Area Correspondent Rommel Conclara won Best Television Documentary for “Filipino Chef Sharwin”. In his team are videographer Jeremiah Ysip with Danny Manansala as editor. “Balitang America”, the award-winning daily news program produced by and aired on ABS-CBN The Filipino Channel (TFC) in North America and also globally on ANC, scored victories at the 5th Plaridel Awards held by the Philippine American Press Club (PAPC-USA) recently at the Kalayaan Hall of the Philippine Center in San Francisco. Keynote Speaker at the event was Ted Unarce, an award-wining film producer, author, and founder of MDS Foundation, a non-profit organization (www.ndsfoundation.us) devoted to aiding victims of human trafficking and domestic violence. He also co-founded TWIFF, (www.twiff.org) Third World Independent Film Festival which was recently held in San Francisco. Unarce’s award-winning documentaries include “Modern Day Slaves” which was featured at the Cannes Film Festival and subsequently screened at institutions of higher learning across the United States. Unarce urged FilAm journalists to always write like they were writing for mainstream America and not just for a Filipino audience. The evening’s program was dedicated to Ness Ocampo, veteran radio broadcaster, who recently passed. Honorable Mentions were presented to Tet Valdez of TheFilamLA, for Best Photojournalism, “Filipinos among Asian rallying around Hillary Clinton”; Elizabeth Ann Quirino, Positively Filipino, “My Tarlac lights up the world with Belenismo” for Best Tourism Feature, and Jesse T. Reyes, The Filipino Reporter, “Fierce fascination and fondness for ballin’ basketball forever,” for Best Sports Story. Janelle Feraro, who recently won the 2016 Junior Champion of the World Competition of Performing Artists, and Myles Garcia, who describes himself as “an amateur raconteur who dabbles in the treasures of the International and Great American Songbooks”, entertained the guests. Sponsors were Philippine Airlines, Pacific Gas & Electric, Dept. of Tourism, Inquirer.net and Mango Tours.